@INIREAD doesn't care about special characters. But you'll want to turn off nested variable expansion (SETDOS /X-4) so TCC doesn't try to expand the variables in the returned value. If you want to echo it (why?) you can use ECHOX, which doesn't do any variable expansion, redirection, multiple commands, or compound commands. 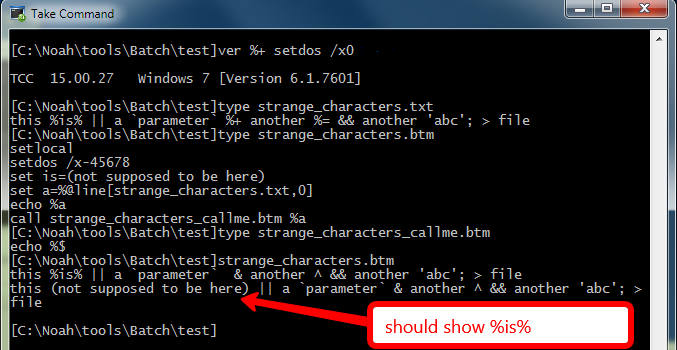 Almost there... How can I pass this strange line in a variable (a) to another command without the %is% expanding? And yes, the @iniread works fine, was just an example of getting a line with special characters, I'm also using @fileread, @line, and @xmlxpath. The echo is to be able to see the line on the console as part of the script. Attached are the files shown. Try using Charles Dye's SafeChars.dll, in particular, function @SafeLine. You should be using ECHOX, not ECHO. I thought it was limited to literal strings. ECHOX will not display variables (or any other special processing) -- but the OP didn't *want* to display variables.